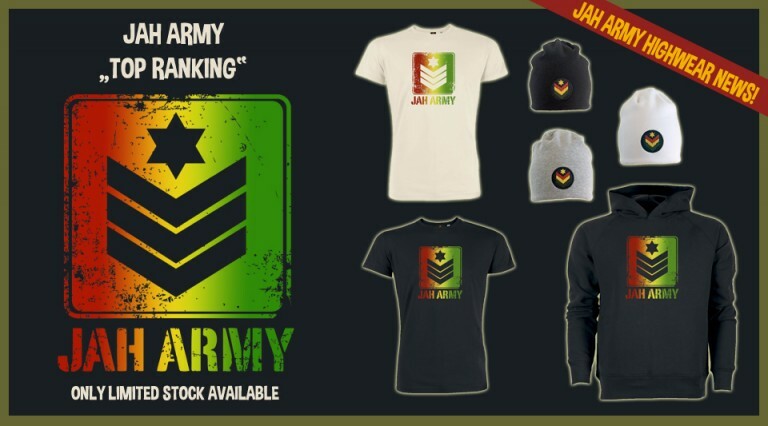 While we are preparing the next strike of the Jahvengers we’d like to present our brandnew Beanies and remind you of the very last Hoodies & Shirts of our latest limited “Top Ranking” edition. Classic stuff on organic & fairtraded garments as always with handmade skinfriendly prints for a unique & cosy Jah Army Uniform feeling. Seen? The design has been coloured with a unique flow of Red, Yellow & Green and comes on black and vintage white garments. As each garment has been handprinted, colours may vary and make each item a unique collectors item. Unfortunately the Vintage White Soundbwoy Hoodie has already been sold out. So don’t wait too long for one of the black ones. Get this & much more at our I-fficial – ruff & tuff – partner store Reggae Wear. Worldwide shipping and all questions answered in no time for the most Irieness. Check it!